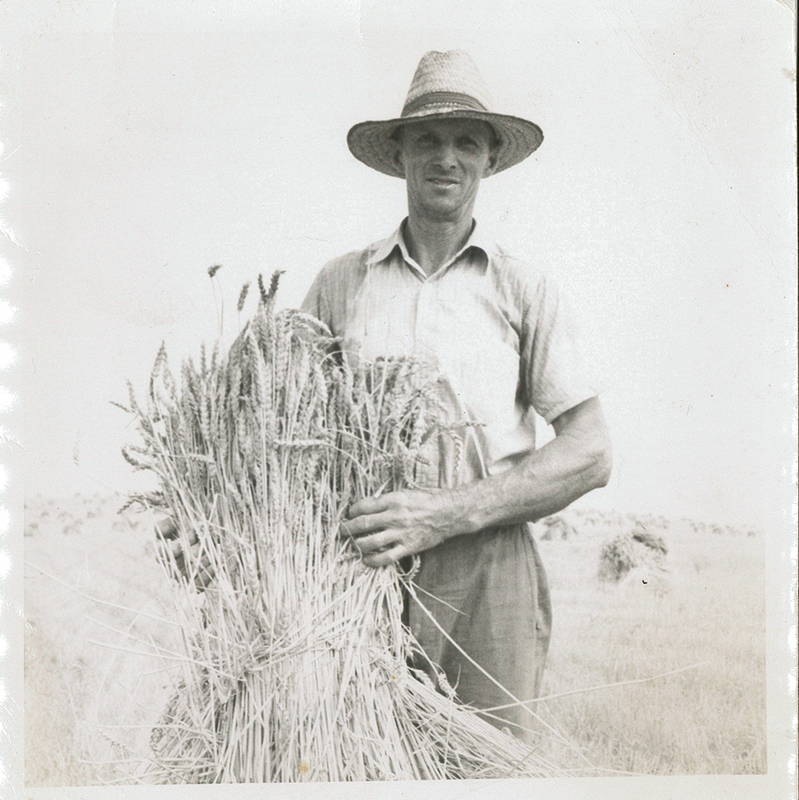 Aug. 12, 1947: Miller photographed Dean Fullerton holding a sheaf of wheat waiting to be threshed. Photo Albert Miller Photographs, Meadowcroft Rockshelter and Historic Village, Heinz History Center. Meadowcroft founder Albert Miller always seemed to have a camera in hand. 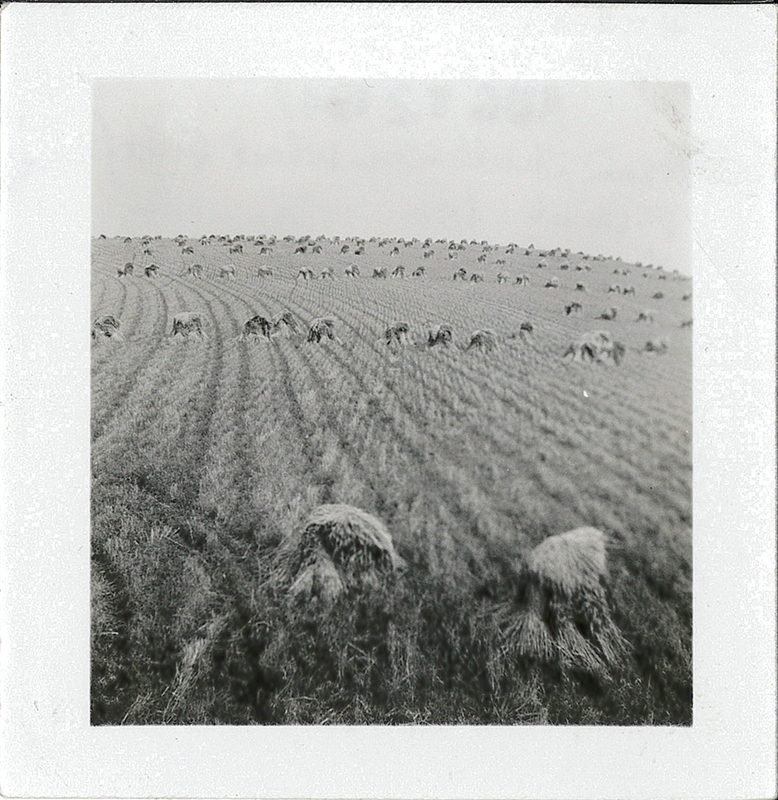 He took thousands of images of different types of subject matter, but one thing he focused on was agriculture in Washington County, Pa.
Before machinery was used, harvesting wheat was an incredible time and labor-consuming task. Wheat had to be reaped using a scythe, bound into a sheaf, and stacked in a shock to dry completely. The process of threshing separated the grain from the stock using either horses walking over the cut wheat or a person wielding a flail. The last step was winnowing. Still mixed in with the grains were parts of the stock and the chaff, which needed to be separated. The pile was thrown in the air while wind carried away the chaff and left the grains to fall back down to the ground. Throughout the late 18th, 19th, and 20th centuries, different types of machinery were invented to ease this process by taking over one or multiple steps. One of these machines was invented by Andrew Ralston, of Hopewell Township, Washington County, Pa., and manufactured by Robert McClure in West Middletown, Pa., just a few miles from Meadowcroft. Patented in 1842, this device was regarded as the first to successfully combine the steps of threshing and winnowing in one operation. This series of photographs Miller took in August 1947 was of wheat threshing at Dean Fullerton’s farm just east of Atlasburg, Pa.
Dean Fullerton’s field full of shocks of wheat waiting to be picked up for threshing. 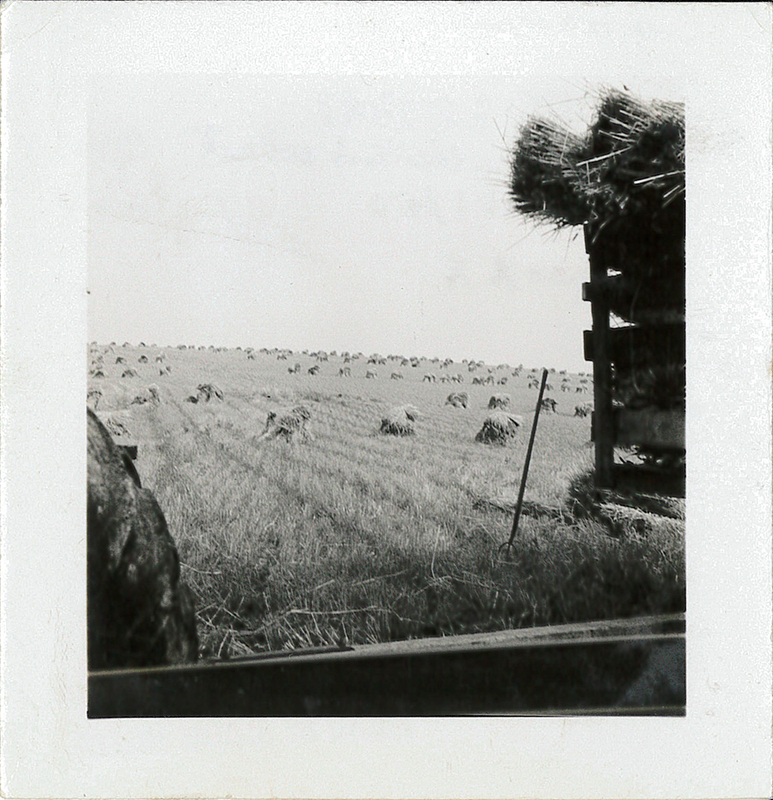 The shocks of wheat are framed by the tractor at the left and the belt in the foreground. The tractor and belt were used to supply power to the threshing machine. The wagon on the right sits full of sheaves waiting to be threshed. The tractor on the far left was used to power the threshing machine while the other pulled the wagon around the field to be loaded with sheaves. The man on top of the wagon feeds wheat into the thresher, which separates the grain from the chaff and stock. The grain is funneled into the bed of the truck in the foreground and the rest is funneled into a large pile off frame to the right. Dean Fullerton’s 35-acre wheat field. 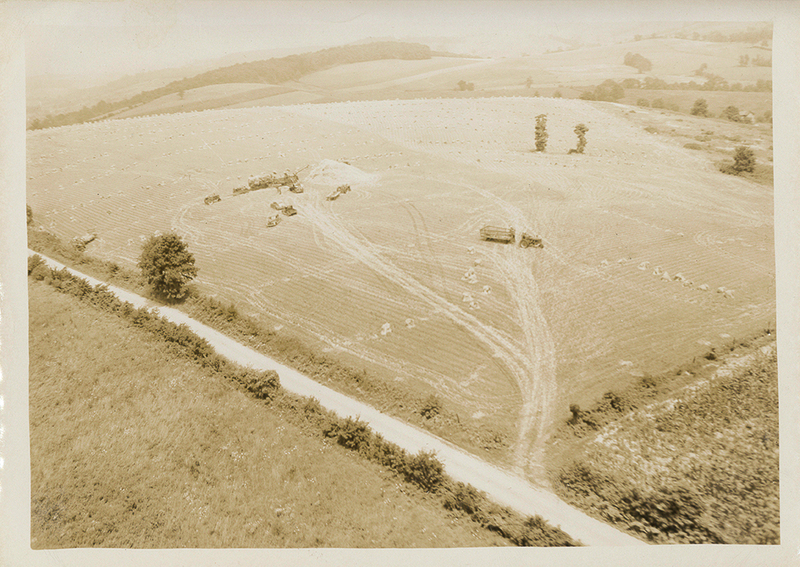 On Aug. 14, Miller flew overhead to photograph the work still going on at the Fullerton Farm. This photo offers a real sense of scale of how much work went into harvesting the 35-acre wheat field. In this view, notice the large pile of straw, which would be reused to feed animals and as bedding. This 35-acre field yielded 1512.5 bushels, which equates to about 45 tons, of wheat at just over 43 bushels per acre. 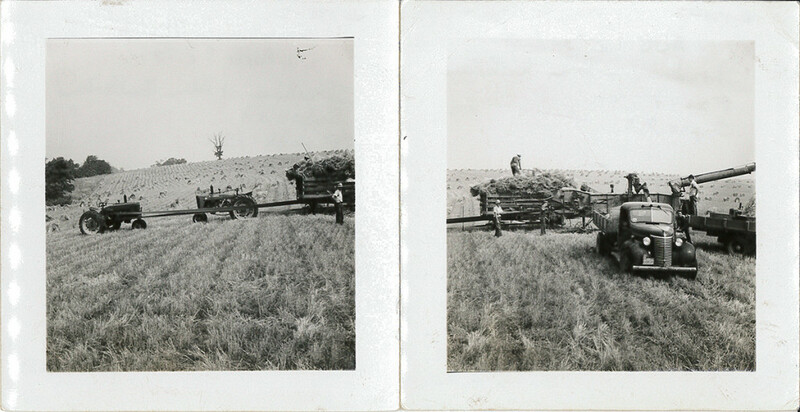 These photographs show an almost identical method of threshing previously used on Bancroft Farm but was quickly fading out of use. Bancroft had already upgraded to a grain combine in July of 1940, which took over the reaping, threshing, and winnowing process in one step. This is the method still in use today to harvest grain. Some of these images, as well as others of Albert Miller’s, are on display in Meadowcroft’s Miller Museum. See them when Meadowcroft reopens to the public on Sunday, May 1. Branton, Harriet. “The Inventor From Hopewell Township.” Observer Reporter, October 27, 1979, sec. B, p. 9. Mark Kelly is a tour guide and interpreter at Meadowcroft Rockshelter and Historic Village.